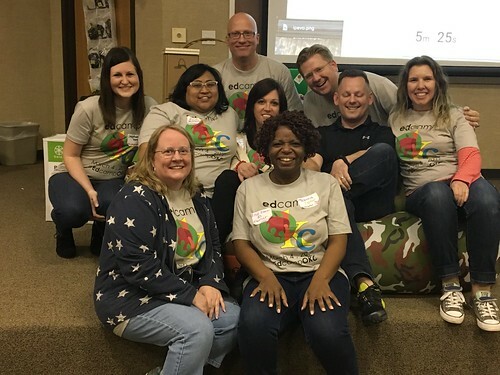 FREE registration is now available and open for the EdCampOKC conference on Saturday, March 3, 2018 in Norman, Oklahoma! This will be our 6th EdCampOKC event, and this year Irving Middle School in Norman Public Schools will host us. Please mark your calendar, register online, share this with educators you know, and get ready to learn as well as network with us on the first Saturday in March in Norman! This entry was posted in news by Wesley Fryer. Bookmark the permalink. Can you tell me what EdCamp is about? Hi Rose. Our About page has some great video links which explain EdCamp well. Basically it’s an “unconference” where participants decide the topics and themes they want to discuss and learn about. We spend about a half hour at the start of the day planning the sessions we want to have, and anyone can write topics on the session boards. Vendors are not allowed to have sessions, and all sessions should be conversations rather than 1 person talking and delivering information. Then we have 2 sessions in the morning, a break for lunch, an “app smackdown” (where different people share helpful apps and websites they use and like) followed by 2 more sessions. More prizes at the end of the day. That’s about it!